Popping into the shed to refill the bird feeder I noticed the way the sun was both illuminating and silhouetting the young growth on the honeysuckle growing outside. 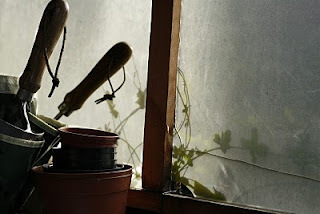 The plastic panes in the shed windows created a soft, diffuse light that lent a painterly quality to the mundane objects it fell on, and I dashed inside for my camera and tripod. It took an hour to get the shot, as clouds obscured the sun and a brisk breeze set the honeysuckle bines moving. Sometimes what seems like a gift actually takes time and work to capture, while what seem to be demanding images fall into your lap.